A 13-year-old boy has died after suffering a brain haemorrhage during a Muay Thai fight on Monday night. Prime Minister Prayut Chan-o-cha today pledged to push for greater connectivity to strengthen business and investments in ASEAN when Thailand assumes the chairmanship of the regional grouping next year. THAILAND has proposed to host the first Asean Summit of the year in June instead of April when Bangkok chairs the group in 2019, as the country is worried about a delay in the next general election, sources said yesterday. In addition to the visa fee waivers approved last week, the cabinet on Tuesday approved more measures to lure foreign visitors. Key ministers came out on Tuesday to confirm there are no plans to further defer the long awaited general election. The State Railway of Thailand (SRT) has opened a bid between private companies for the right to construct high-speed rail lines connecting three of the nation’s airports. The National Council for Peace and Order (NCPO) has called for greater stringency against the smuggling of narcotics after seeing a significant uptick in drug-related arrests over the last month. THE RADIOACTIVE waste found at Chon Buri’s Laem Chabang Seaport has been analysed though more investigation is required to track its origin and movement, the authorities said. Legalization of medical cannabis is on track to become law after the cabinet signed off Tuesday on legislation that would allow limited uses of it and other Category 5 drugs. The Ministry of Commerce has confirmed that cannabis extract cannot be patented. The National Food Authority (NFA) has failed for the third time to secure supply for bulk of the 250,000 metric tons (MT) of rice it has been ordered to import for the remainder of the year as Vietnam and Thailand — the only countries with existing rice trade agreement with the Philippines — won’t sell their rice at cheaper price. The Royal Thai Air Force is delivering supplies of necessities and medications to flooded communities in Prachuap Khiri Khan province. It’s that time of the year when Thai airspace becomes contested by the launching of thousands of traditional lanterns. Phuket’s Governor Pakkapong Tawipat says that the barge which has been making its way from Singapore with a 1,200 tons crane this week, has arrived at ready to help with the recovery of ‘Phoenix’. The Governor is expecting that, if the weather holds, the boat will be brought to the surface before Thursday. Thailand’s True Corporation has signed an expanded contract with Amdocs aimed at enhancing the operator’s convergence platform to support IoT services for enterprises and consumers. Police have arrested a Myanmar man after he confessed to fatally stabbing his housemate in Phuket Town last night (Nov 12) in what he claims was self-defence. 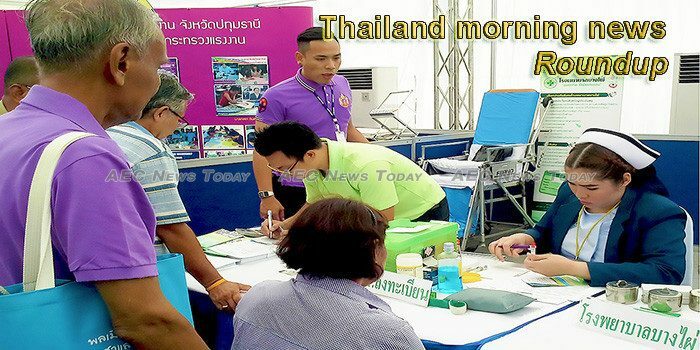 The European Union said time is running out if Thailand is to invite it to observe general elections slated for February. Seven suspected insurgents have received life sentences in prison after a court found them guilty of being involved in an attack that wounded 12 policemen at a security checkpoint in the Deep South province of Yala last year, according to court documents. Anti-junta activist Chanoknan Ruamsap, who fled the country earlier this year after being charged with lese majeste, has received political refugee status from the South Korean government. SET-listed energy firm Bangchak Corporation Plc (BCP) has earmarked 77 billion baht for plans to expand and develop both domestically and overseas over the next four years. The Treasury Department wants to raise the rent for land being used for commercial purposes to a 4% return on assets, up from 2-3% of ROA, to match the economic situation, the department chief says. British Triumph Motorcycles has cut its sales view for this year from 3,000 big bikes to 2,500 after sales shrank in the first 10 months. When an employee causes damage to a company, Thai employers often resort to deducting wages, holiday pay, or overtime payments as a penalty or restitution. A new “world-class” polyol plant for rigid polyurethane foam was opened on Tuesday by the Dow Chemical Company (Dow) in Rayong, Thailand. Kasikorn Securities (KS) is set to unleash its online trading business by launching an e-account opening service, letting customers open cash balance accounts without showing paper documents. MOST LISTED property firms show strong growth in their financial results for the first nine months of this year, thanks to strong demand in the market.